Good meatballs are an often underrated element of many popular meals. They are eaten and enjoyed internationally and can be served with pasta, on their own smothered in sauce or stuffed inside wraps. Here we are going to look at what makes a perfect meatball for any kind of occasion. First things first – nothing makes a better meatball (or any other dish) than the quality of the ingredients you choose. Use top quality meat, and you’re half way there. 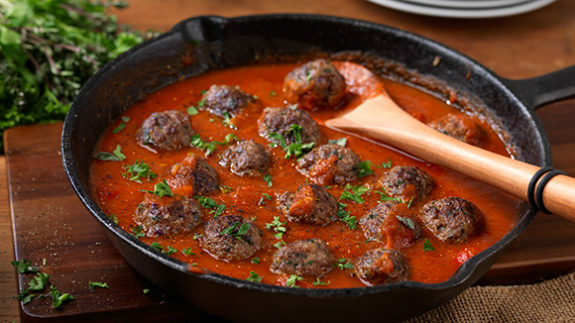 Many chefs suggest mixing different kinds of meat (beef, pork and veal) for tastier meatballs. A good combination uses half beef and half pork. Before shaping into balls, season the meat with herbs for added flavour. You should also cook your onion and garlic before adding them to the meat mixture but remember to allow the onions and garlic to cool before adding them to the other ingredients as you don’t want the mixture to start cooking before it goes into the pan. Take a few slices of white bread, crusts removed, and soak the slices in milk. You can add cheese and seasoning for a little more taste, if required. Mash the bread up completely before adding along with the eggs, to your meat. Remember that eggs are not a source of moisture. They’re in the meatball mix to bind the meat, breadcrumbs, cheese and herbs. If you add too many eggs to your recipe, they will cook and make the meatballs dense and spongy; you want light, airy meatballs. For 500g of meat, you usually won’t need more than one egg. For great flavour add a Knorr Stock Pot in with the egg, mixing well to ensure the stock pot blends through the mince. Do not overmix the meat mixture or it will compact. If this happens, the meatballs will be tough in texture when cooked. As with all minced meat recipes, too much handling will make the meatballs tough. Wet your hands with cool water or oil before shaping the meatballs so that the mixture doesn’t stick to your hands. Use an ice cream scoop to portion your meatballs. If they’re the same size, they’ll cook evenly. When browning the meatballs, don’t rush to turn them or they may fall apart in the pan. Wait until the bottom has browned before carefully turning with a wooden spoon or spatula. As a final step, you can braise them in your favourite homemade sauce. An incredibly quick and easy meatball recipe is to add an egg, some breadcrumbs and one Knorr Beef Stock Pot to 500g of mince. Mix until the Stock Pot is thoroughly combined, then shape into meatballs. Panfry in 1 tablespoon of oil to until lightly golden brown, then add a tin of chopped tomatoes, reduce the heat and simmer, covered for 20 minutes or until meatballs are cooked through. For a really exciting meal time treat, why not try our recipe for Pasta with Cream Cheese and Pork-Sausage Meatballs? A creamy take on a classic dish, this recipe uses the rich flavours of cream cheese, mustard, onion and garlic, all enhanced with Knorr Chicken Stock. Simply discard sausage skins, roll the meat into meatballs, cook with garlic and then simmer with the other ingredients until a sauce is formed. Toss with piping hot spaghetti for a truly mouth-watering meal.